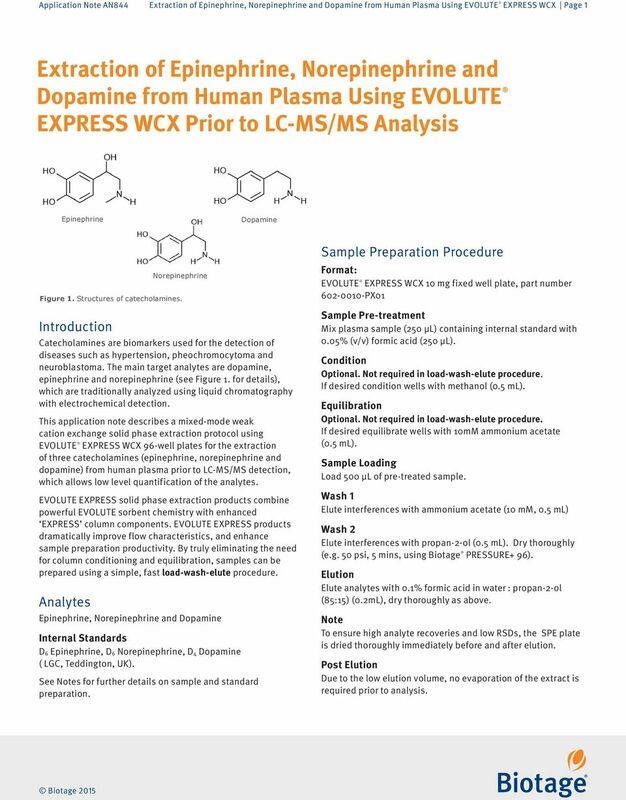 Download "Extraction of Epinephrine, Norepinephrine and Dopamine from Human Plasma Using EVOLUTE EXPRESS WCX Prior to LC-MS/MS Analysis"
1 Application Note AN844 Extraction of, and from Human Plasma Using EVOLUTE EXPRESS WCX Page 1 Extraction of, and from Human Plasma Using EVOLUTE EXPRESS WCX Prior to LC-MS/MS Analysis Introduction Catecholamines are biomarkers used for the detection of diseases such as hypertension, pheochromocytoma and neuroblastoma. The main target analytes are dopamine, epinephrine and norepinephrine (see Figure 1. for details), which are traditionally analyzed using liquid chromatography with electrochemical detection. 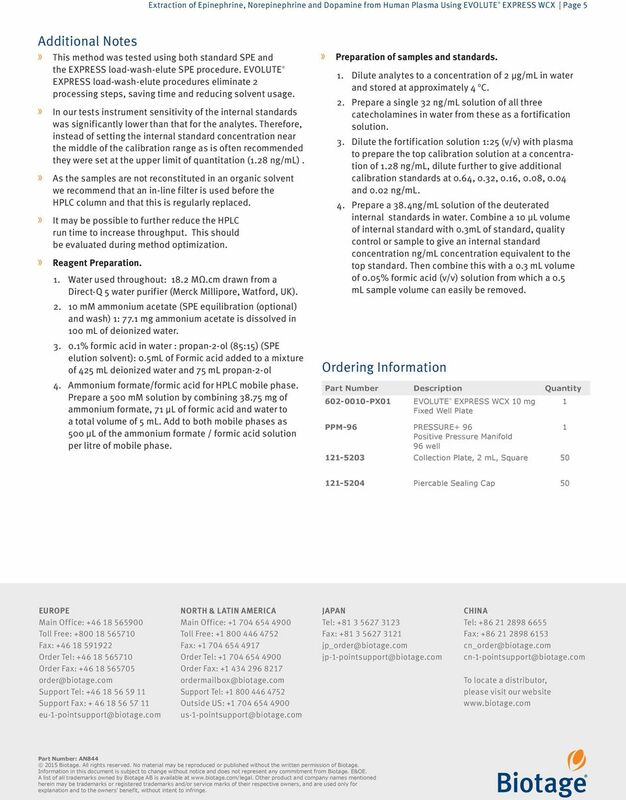 This application note describes a mixed-mode weak cation exchange solid phase extraction protocol using EVOLUTE EXPRESS WCX 96-well plates for the extraction of three catecholamines (epinephrine, norepinephrine and dopamine) from human plasma prior to LC-MS/MS detection, which allows low level quantification of the analytes. EVOLUTE EXPRESS solid phase extraction products combine powerful EVOLUTE sorbent chemistry with enhanced EXPRESS column components. EVOLUTE EXPRESS products dramatically improve flow characteristics, and enhance sample preparation productivity. By truly eliminating the need for column conditioning and equilibration, samples can be prepared using a simple, fast load-wash-elute procedure. Analytes Figure 1. Structures of catecholamines., and Internal Standards D 6, D 6, D 4 ( LGC, Teddington, UK). See Notes for further details on sample and standard preparation. Sample Preparation Procedure Format: EVOLUTE EXPRESS WCX 10 mg fixed well plate, part number PX01 Sample Pre-treatment Mix plasma sample (250 μl) containing internal standard with 0.05% (v/v) formic acid (250 μl). Condition Optional. Not required in load-wash-elute procedure. If desired condition wells with methanol (0.5 ml). Equilibration Optional. Not required in load-wash-elute procedure. If desired equilibrate wells with 10mM ammonium acetate (0.5 ml). Sample Loading Load 500 µl of pre-treated sample. Wash 1 Elute interferences with ammonium acetate (10 mm, 0.5 ml) Wash 2 Elute interferences with propan-2-ol (0.5 ml). Dry thoroughly (e.g. 50 psi, 5 mins, using Biotage PRESSURE+ 96). Elution Elute analytes with 0.1% formic acid in water : propan-2-ol (85:15) (0.2mL), dry thoroughly as above. Note To ensure high analyte recoveries and low RSDs, the SPE plate is dried thoroughly immediately before and after elution. Post Elution Due to the low elution volume, no evaporation of the extract is required prior to analysis. 3 Extraction of, and from Human Plasma Using EVOLUTE EXPRESS WCX Page 3 Results Table 3. Extraction recoveries (analytes spiked into human plasma at a concentration of 1.28 ng/ml) Analyte Standard SPE Extraction Recovery EXPRESS Load-Wash-Elute SPE % RSD Extraction Recovery % RSD Linearity was checked from the concentration used to assess recovery (1.28 ng/ml) down to a common lower spiked level of 20 pg/ml. Calibration lines for each analyte are displayed using the full extraction method (left) and a simplified load-wash-elute procedure (right). Full Extraction Procedure Load-Wash-Elute Figure 2. Representative calibration plots of catecholamines. 4 Extraction of, and from Human Plasma Using EVOLUTE EXPRESS WCX Page 4 As no catecholamine free plasma was available for testing, sensitivity was demonstrated by comparing the chromatograms of endogenous levels and those over-spiked at a concentration of 20 pg/ml (displayed on the same scale). 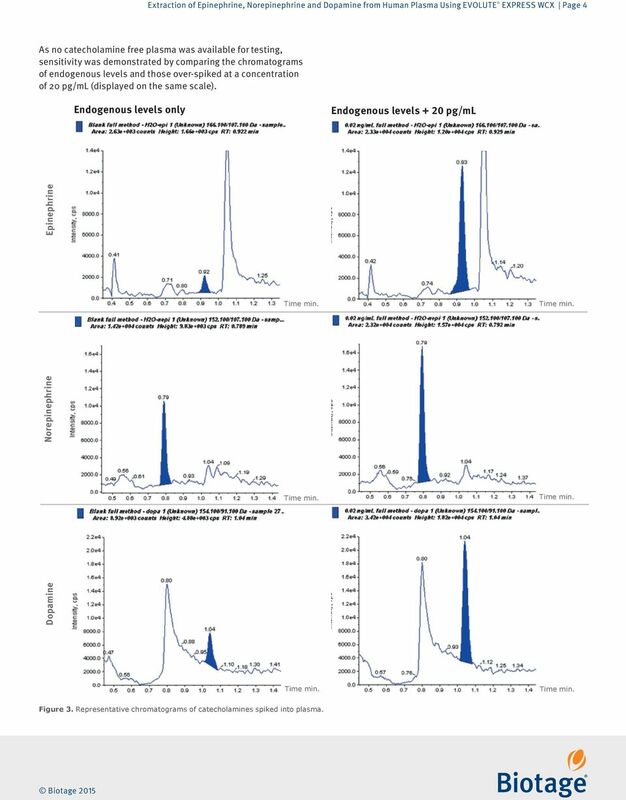 Endogenous levels only Endogenous levels + 20 pg/ml Figure 3. Representative chromatograms of catecholamines spiked into plasma. 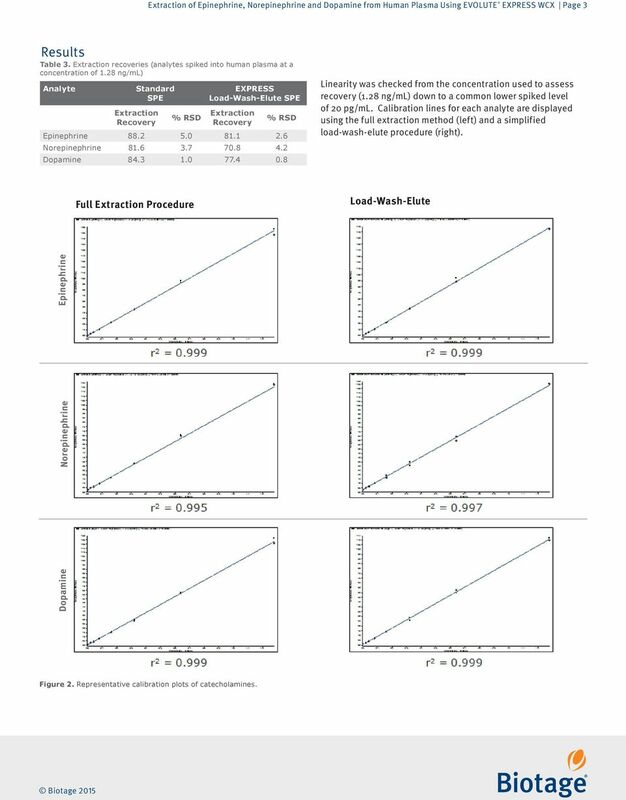 5 Extraction of, and from Human Plasma Using EVOLUTE EXPRESS WCX Page 5 Additional Notes»» This method was tested using both standard SPE and the EXPRESS load-wash-elute SPE procedure. EVOLUTE EXPRESS load-wash-elute procedures eliminate 2 processing steps, saving time and reducing solvent usage. In our tests instrument sensitivity of the internal standards was significantly lower than that for the analytes. Therefore, instead of setting the internal standard concentration near the middle of the calibration range as is often recommended they were set at the upper limit of quantitation (1.28 ng/ml). As the samples are not reconstituted in an organic solvent we recommend that an in-line filter is used before the HPLC column and that this is regularly replaced. It may be possible to further reduce the HPLC run time to increase throughput. This should be evaluated during method optimization. Reagent Preparation. 1. Water used throughout: 18.2 MΩ.cm drawn from a Direct-Q 5 water purifier (Merck Millipore, Watford, UK) mm ammonium acetate (SPE equilibration (optional) and wash) 1: 77.1 mg ammonium acetate is dissolved in 100 ml of deionized water % formic acid in water : propan-2-ol (85:15) (SPE elution solvent): 0.5mL of Formic acid added to a mixture of 425 ml deionized water and 75 ml propan-2-ol 4. Ammonium formate/formic acid for HPLC mobile phase. Prepare a 500 mm solution by combining mg of ammonium formate, 71 µl of formic acid and water to a total volume of 5 ml. Add to both mobile phases as 500 µl of the ammonium formate / formic acid solution per litre of mobile phase. Preparation of samples and standards. 1. Dilute analytes to a concentration of 2 µg/ml in water and stored at approximately 4 o C. 2. Prepare a single 32 ng/ml solution of all three catecholamines in water from these as a fortification solution. 3. 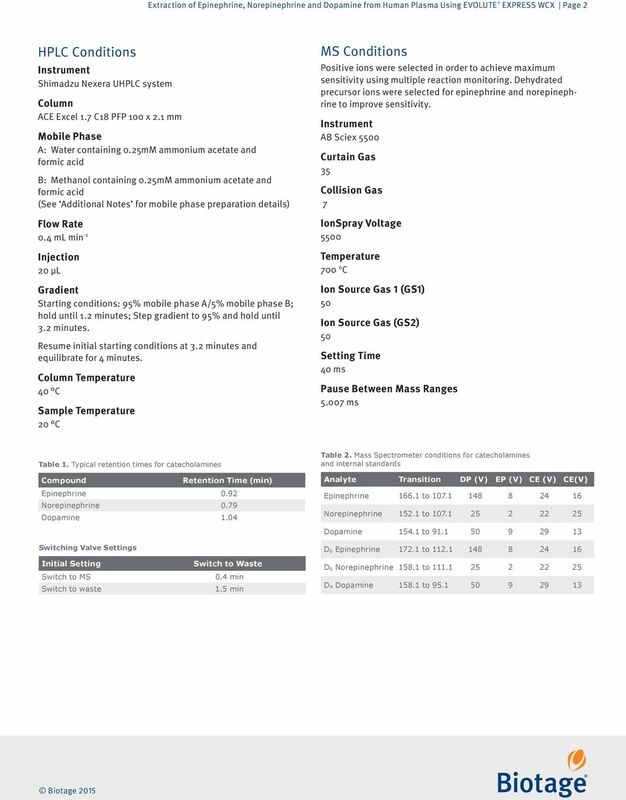 Dilute the fortification solution 1:25 (v/v) with plasma to prepare the top calibration solution at a concentration of 1.28 ng/ml, dilute further to give additional calibration standards at 0.64, 0.32, 0.16, 0.08, 0.04 and 0.02 ng/ml. 4. Prepare a 38.4ng/mL solution of the deuterated internal standards in water. Combine a 10 µl volume of internal standard with 0.3mL of standard, quality control or sample to give an internal standard concentration ng/ml concentration equivalent to the top standard. Then combine this with a 0.3 ml volume of 0.05% formic acid (v/v) solution from which a 0.5 ml sample volume can easily be removed. Ordering Information Part Number Description Quantity PX01 EVOLUTE EXPRESS WCX 10 mg 1 Fixed Well Plate PPM-96 PRESSURE Positive Pressure Manifold 96 well Collection Plate, 2 ml, Square Piercable Sealing Cap 50 EUROPE Main Office: Toll Free: Fax: Order Tel: Order Fax: Support Tel: Support Fax: NORTH & LATIN AMERICA Main Office: Toll Free: Fax: Order Tel: Order Fax: Support Tel: Outside US: JAPAN Tel: Fax: CHINA Tel: Fax: To locate a distributor, please visit our website Part Number: AN Biotage. All rights reserved. No material may be reproduced or published without the written permission of Biotage. Information in this document is subject to change without notice and does not represent any commitment from Biotage. E&OE. A list of all trademarks owned by Biotage AB is available at Other product and company names mentioned herein may be trademarks or registered trademarks and/or service marks of their respective owners, and are used only for explanation and to the owners benefit, without intent to infringe. AppNote 4/2014. Prep-and-Shoot : The Completely Automated Workfl ow for the Hydrolysis and Analysis of Urine Samples by LC/MS/MS. Validation of Analysis of Amphetamines, Opiates, Phencyclidine, Cocaine, and Benzoylecgonine in Oral Fluids by Liquid Chromatography Tandem Mass Spectrometry Subbarao V. Kala*, Steve E. Harris, Tom D.